What is Cumaru & why Cumaru? Brazilian Teak, commonly called Cumaru, is a very hard and strong wood orginated from South America Countries.Brazilian Teak(cumaru) hardwood materials has been long imported from brazil in bulk quantities milled in China factories.Brazilian teak hardwood floors has an janka hardness 3540psi which is close to Brazilian Walnut , nearly on top in Janka hardness among all other tropical hardwood species.Brazilian teak (cumaru) wood is sensitive when exposed to sunlight,the fresh color light yellow will become dark brown if barely exposed it to sunlight after a few years.Therefore precautions is needed if you choose brazilian teak hardwood flooring decorating your house. 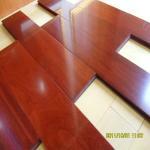 C&L hardwood supply premier quality cumaru hardwod flooring from our our factory with very competitve offer,from wide plank hardwood to strip hardwood ,prefinished or unfinished,all we cutting to customers' requirments,applying the UV coating for the wood on our factory production line. Edges & Sides: C&L hardwood mill the solid cumaru wood with four side Tongue & Groove Joint,board to board fit perfectly to each other,easy to installation.Each board is with slightly 45°Micro-beveled Edge,which makes the flooring board joint gap even and elegant. 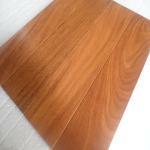 Brazilian teak (cumaru) timber moisture content : Normally the cumaru raw wood is properply dried under a MC of 12% in order to produce a qualfied timber floor.C&L hardwood factory present a report as a proof that each batch of our solid cumaru timber floor keeps with moisture content in the range of 10%-12%. 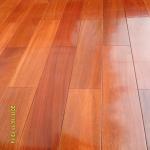 Solid cumaru hardwood flooring Acacia flooring from C&L hardwood is sealed by UV finish on six sides of the floor board , it enhances the dampness resistance to garantee the board stability after long time use. Flooring surface is applied by 8 layers primer coating layers,4 layers top UV coating layers.The paint we use Germany treffert aluminium oxide UV coating which greatly enhanced the scratch & dent resistance of the cumaru wood. 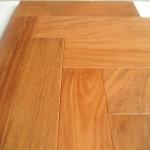 Warranties: C&L hardwood brazilian teak solid flooring has a warranty of 35 years structural under proper maintaince.7 years surface UV coating wear though warranties.5 times more sanding and refinish on the cumaru flooring is absolutely possible.